The Inca Army was a multi-ethnic army charged with defending the sovereignty of the Inca Empire, expanding its borders, and putting down rebellions. It was also often used for political purposes, such as executions or coups. As the Incan Empire grew in size and population, the army did the same. At the height of the empire (under the reigns of Tupac Yupanqui and Huayna Capac), the army grew to approximately 200,000 men. The militaristic nature of the Incan monarchy caused great emphasis to be placed on the army and the position of the common soldier. Soldiers were given food and clothing and state aid was also provided for a soldier's family to ensure that agricultural production did not suffer due to the absence of a productive worker. For these reasons full-time soldiers were held in high regard and they even occupied their own position in the socio-political pyramid. When the army returned to Cuzco following a successful campaign they were received by women and children as heroes in a ceremony held in their honor. The ceremony took place in the Plaza de Armas in Cuzco and consisted of exhibiting the plunder and parading the prisoners as a symbol of the victory. The Inca soldier Cahuide jumping from the tower of Saksaywaman. As the Inca empire grew, the army of peasant warriors was replaced by an army with professional officers. Officers were chosen during the Warachikuy festival during which candidates had to undergo various tests of physical skill such as racing, marksmanship, simulated combat and battle drill. There was even a competition to see if they could stay awake for a long period, and in fact it is reported that some officers could remain awake for a whole week. Inca battalions contained permanent staff (generals and officers) and non-permanent personnel composed of drafted hatun runas (common men) who would be serving their military mit'a public service (comparable to a mandatory military service). Once the mita was fulfilled, each hatun runa would return to their respective ayllu (community). Each battalion was made up of a single ethnic group, the whole group being directed by a kuraka (warlord) who had the same ethnicity. In the event that a kuraka fell in battle a replacement was appointed from within the same ethnic group. In order to prevent rebellions and to promote performance in battle, each ethnic group was divided into two battalions, each one under the command of a general (and both under the command of the kuraka), who would compete against his counterpart in displaying bravery on the battlefield, thus increasing his chances of promotion. This concept of "duality" is widespread in the Andean world, and represents the two Inca dynasties: Hanan and Hurin. Since the government of Tupac Yupanqui, a specialized elite group of soldiers was appointed for the safekeeping of the Sapa Inca ("the one and only Inca") during parades, travel or campaigns. These bodyguards originated primarily in Cusco, even though with time outstanding soldiers from other ethnicities were accepted into the group. This imperial guard, all of them belonging to the nobility, reached a size of 10,000. All members of the Inca army were between 25 and 50 years old. All of the empire's citizens had to perform either military or community service. One of every 50 men over 25 years old (legal age in the Inca Empire) would be chosen for military service. For noblemen, this was an honor and a duty, for common men, it was a means of social promotion. In accordance with the duality concept, one of every 50 young women were selected to serve in the Temple of the Virgins of the Sun. After a certain period of time (usually 6 or 7 years), the military service was considered to be fulfilled for common men. However, professional officers were permanent soldiers and paid by the state. This military caste enjoyed several privileges as the State paid for their food and housing costs as well as clothing and several other gifts such as coca, jewelry, and wives. Runas (common men) from the coastal region, unlike people from the highlands, were not compelled to serve in the army. This is probably explained by their lack of adaptation to the harsh climate conditions of the highlands, where most wars took place. It is worth noting that the army units would march in the company of a large number of women, mostly relatives of the soldiers. Women would take care of cooking and repairing the soldiers' clothes and after battles would attend the wounded and help bury the dead. Inca armies would not fight at night for religious reasons. A group of priests would also be attached to the army units, in order to pray, make sacrifices, and try to weaken the opposing force by casting spells before and during battle. Weapons and other equipment were transported by llamas. During the beginnings of the Incan empire the army was mainly formed of ethnic Inca troops, however, later on only the officers and imperial guards were Incas (the Incas were 40,000 to 100,000 strong and they ruled an empire of 10 to 15 million). The squads were organized according to the ethnicity of the soldiers (auca runas), they were armed and dressed according to their tribe, with animal skins, fabric shields, feathers, jewels or body paints. Once a battle was over, enemy leaders would only be executed if they refused to accept the sovereignty of the Incas. The majority of conquered nations would be absorbed into the Empire. Conquered nations were forced to adopt Quechua as their main language, worship Inca gods and adopt Inca social customs. Inca government officials would perform a careful study of the conquered zone to ensure the achievement of these objectives. The extensive road system built by the Inca Empire was meant both to facilitate commerce and to allow rapid deployment of the army (similar to the Roman road system). A military action would usually be initiated by a military parade to arouse awe in the opposing army. The soldiers would march with their banners and the commander would be carried in his litter carrying the symbol of his command. Should the opposing force still be willing to fight, the general in command (or the Inca himself) would review the troops while musical instruments were played. After this, the commanding officer would rally the troops for the attack. The Sapa Inca himself would rally the troops in larger campaigns, while for smaller rebellions, barbarian invasions, or small campaigns, a general or a prince would be sent as his representative. The Inca army's military effectiveness was based in two main elements: logistics and discipline. In order to facilitate the movement of their armies, the Inca built a vast road system. Staging areas were set along the roads so the troops and animals could rest, and weapons could be readied. Discipline was very rigid. Soldiers were not allowed to leave the battalion, not even during the approach march. Troops would maintain silence, only breaking it just before attacks by yelling and singing in order to intimidate the opposing force. Army squads were organized in the following manner: The front lines were initially occupied by slingshot bearers and archers, which would go to the rearguard of the formation after the initial barrages. The lines behind them were occupied by storm-troopers with clubs and axes, then short-spear bearers and closing the formation long-spear bearers (up to 6 meters long). During a battle on open ground, the Inca army would usually be divided into three groups. The main group would launch a frontal attack against the opposing force while the other two would flank it and circle around behind it to attack from the rear. Before the hand-to-hand combat would start, the Inca army would use ranged weapons (slingshots, arrows and short spears) in order to break the enemy's lines. The army would also feign a retreat, then when the enemy attacked the Incas would counter-attack using a pincer movement. Most enemies in the region were poorly organized and would perform mass frontal charges after breaking formation. As a matter of fact, the Inca army was so well disciplined that it would not often break formation, being able to effectively repel ambushes in jungle, desert, mountain and swamp terrains. In the event that the opposing force would take refuge in a fortress, mountain or city, the Inca forces would cut communication and supply lines in order to isolate the enemy and prevent retreat or requests for reinforcements. If negotiations failed, the Inca forces would attempt to storm the fortress and/or starve the opposing force. Occupied cities and their inhabitants were usually well treated if they surrendered without resistance. However, if the enemy did resist then they could suffer a number of punishments depending on the degree of resistance offered. If a city or tribe surrendered and then rebelled the Inca could even authorize the complete annihilation of the city or ethnic group (as was the case with the Pastos and the Punaeños). Should retreat be necessary the Inca army would usually march along roads in a disciplined manner along the quickest route available. The army would only rest in fortresses with the objective of re-arming should a counterattack be made. Garrisons would be left in the fortresses that controlled the roads in order to delay a possible advance by the enemy. A big advantage for the Inca army over its enemies was its numeric superiority. While adversaries were usually warriors from a single tribe (or at most, an alliance of several tribes), the imperial troops were formed of men from all over the empire. Thanks to the large size of the empire, hundreds of thousands of warriors could be mobilized. This wide variety of men would prove both an advantage (numerical superiority and specialized soldiers for different terrain) and a disadvantage (lack of cohesion between army battalions). Both Inca oral histories and Spanish written accounts estimate the Incas could field armies of 100,000 at a time. The Incas usually sent scouts to watch their enemies, they would also send groups of nobles to negotiate peace treaties and on a number of occasions the servants that they took were spies that tried to bribe enemy officers so that they would betray their kings by retreating during a crucial moment in a battle. There was a reward system in place for distinguished services. Soldiers displaying bravery beyond expectations were rewarded with medals, metal weapons or other objects and uniforms. The Incas also built forts (pucará) where they stored arms, food and reserve soldiers. These fortresses also controlled the main communication routes and were constructed in easily defended locations such as in mountains and on the tops of hills or at the side of a river or road. The largest units in the Inca army were composed of 10,000 men, under the command of a Major General or Apusquin Rantin. This was generally a nobleman from Cuzco who would have been a veteran of several campaigns. The head of the field army was the Apusquispay, he would have been a noble chosen by the Inca and he would have shown himself to have been in good physical and mental condition at the Huarachico trials. In order to give orders the generals used conche blowers, trumpeters or drummers to communicate with their lieutenants. Inca soldiers carried several types of simple weapons, according to the ethnic group to which they belonged. For example, Chanca soldiers preferred the use of clubs or macanas, while Antisuyu (Jungle highlands) troops more often leaned towards the use of bow and arrow. Shields (Quechua: Hualcana): Used by higher ranking soldiers, built from wood covered in leather. Could be round, square or rectangular. Helmets (Quechua: Uma chucu): Mostly wooden, some were reinforced with copper. Copper helmets were used by generals and high-ranking officers, wood helmets could be used by regulars if they found them comfortable. Armour: Also used by officers and noblemen. Would simply consist of thick and padded cotton tunics, with wooden plates to protect the back. Estolica - Small, flexible spear thrower to throw projectiles (similar to the Aztec atlatl) were mostly employed by the jungle troops. Slings (Quechua: huaraca) - Were composed of a regular-sized cord in which a projectile was placed (in this case, rounded stones). The projectile would be thrown with a circular movement of the huaraca. Bolas or ayllos - Two or three stones tied to the ends of a length of rope to be swung around the head and then thrown at enemies (also used in hunting). Spears (Quechua: Suchuc Chiqui) - favored by Cuzco troops. All generals would use them as symbols of power. Macana (Quechua: chaska chiqui, star-headed spear)- Wooden shaft with a heavy object at the top. Normally these heavy objects would have star shapes (to maximize chances of breaking bones) and were the most common weapons in the Inca arsenal. It is said the objects at the top of the weapon could be made of gold or silver according to the rank of the soldier. Bow and Arrow - Used mostly by jungle troops (Antisuyo region). Some jungle tribes used two metre long arrows capable of going through several enemies at once which also had the objective of frightening the enemy causing them to break ranks or flee. clubs (Quechua: chambi) - Wooden sometimes with spikes. Mostly used by southern nations. Axes (Quechua: cuncha chucuna, neck-breaker) - Could be made of stone or copper. Pachacútec using a sling or Huaraca. After the arrival of the Spanish, the Inca adopted European military technology such as horses and swords. It is known that Manco Inca Yupanqui led an Inca cavalry unit against Spanish occupation forces. Peaceful conquest was possible when a curaca agreed to recognize the Sapa Inca as their emperor in return for a number of benefits. These benefits could include gifts, investment in public works, recognition at their investiture, interchange of women to establish family ties etc. Whether submission was due to fear of the Inca army or genuine friendship the curaca became a beneficiary of the offered gifts, but he also became subject to Inca demands: his lands had to be handed over to the estate, he had to supply labour and soldiers etc. It was a conquest through reciprocity. Violent conquest would occur if a tribe was unwilling to accept the Sapa Inca as their emperor. This generally resulted in a bloody war. The conquered tribe would receive reprisals according to the length of the war. The defeated leader would be executed and, depending on the degree of their rebellion, the subjects would either be moved to a distant place or, in extreme cases, totally annihilated as a punishment to avoid future uprisings. Expansion of the Inca Empire. This phase lasted from the beginning of the Inca period until the end of the rule of Pachacuti (or Pachacútec). During this phase the army was relatively small and weak. The only battles it fought were for reasons of defense or survival. On occasions the rulers also led the army into battle. There were frequent battles during this period against small tribes such as the Alcahuasis or the Canas. The Aymara or the powerful Chancas were greater threats and the Inca army had to confront them on a number of occasions. This period started with the defeat of the Chancas, with Pachacuti at the head of the Inca army. From this time on the Inca army would be a multiethnic army and it would be more sophisticated and numerous. The conquered ethnic groups rapidly became a part of the Inca nation and contributed men to its armies. During this period the majority of the wars involved the conquest of new territories and it was during this period that the army was at its most powerful. During this period the majority of the army was decimated by illness, Spanish attacks and rebellions. Initially the Inca soldiers feared the horses and firearms of the Spanish which reduced their fighting efficiency. However, they soon forgot their fears and some Inca battalions even fought with swords and Spanish weapons and as cavalry units. "...it was something to see them bravely ride out with Spanish swords, shields and helmets and every Indian armed in this way charged on horseback...the Inca (Manco Inca) appeared on horseback among his people with his lance in his hand..."
— crónicas de Antonio de Herrera. Historia general de los hechos de los castellanos en las Islas y Tierra Firme del mar Océano . Madrid (1601–1615). For the largest battles the Inca army was commanded by Quizquiz and Manco Inca Yupanqui who was commander during the battle of Sacsayhuamán. At the end of this period the Inca army lost battles not just to the Spanish but also to subjected tribes that took advantage of the arrival of the Spanish. ↑ Waldemar Espinoza, Los Incas, page 361. The Inca armies would have been composed of men from Cuzco and Quito as well as coastal and forest dwellers etc. ↑ Such as those carried out by Cápac Yupanqui, Inca Roca y Atahualpa. ↑ Waldemar Espinoza, Los Incas, page 361. 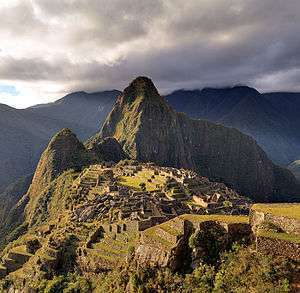 Agriculture was the foundation of the Inca economy, which could not be weakened for any reason. ↑ Waldemar Espinoza, Los Incas, page 377. The Inca armies were received in Cuzco's Plaza de Armas. ↑ Victor Angles Vargas, Historia del Cusco incaico, page 265. ↑ Waldemar Espinoza, Los Incas, page 361. ↑ María Rostworowski, Historia del Tawantinsuyu page 145. ↑ Waldemar Espinoza, Los Incas, page 361. A written source dating from 1582 states that Tupac Yupanqui had a bodyguard of professional soldiers. ↑ "Discovery Channel-Incas" Revised 3 January 2008. ↑ "Peruchay: Servicio militar obligatorio en el ejercito inca" (in Spanish). Retrieved 3 February 2011. ↑ Joaquin Pibernat; Juan Martin Hilbert; Cristobal Cebral; Kevin Richards. "los incas - Monografias.com" (in Spanish). Retrieved 3 February 2011. ↑ D;Altroy, Terence N. (2002). The Incas. Blackwell Publishing. p. 216. ISBN 0-631-17677-2. 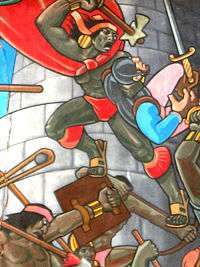 1 2 "Rebelión de Manco Inca" Revised 3 January 2008. ↑ Waldemar Espinoza, Los Incas, page 51. As occurred with Sinchi Roca or even Pachacútec himself. ↑ Waldemar Espinoza, Los Incas, page 68. During this period the Aymara were the main threat to the Incas. However, the Chancas were a more important threat during the period of Viracocha and Pachacútec. ↑ Waldemar Espinoza, Los Incas, page 102. It was during this period that the number of soldiers in the Inca army reached 200,000 . 1 2 "La conquista del Perú" Revised 3 January 2008. ↑ Julio R. Villanueva Sotomayor, El Perú en los tiempos modernos, page 51. Quisquis was in command for many battles against the Spanish, he was finally assassinated by his own troops. ↑ Julio R. Villanueva Sotomayor, El Perú en los tiempos modernos, page 65. All the Spanish armies always received a great deal of support from the indigenous tribes.